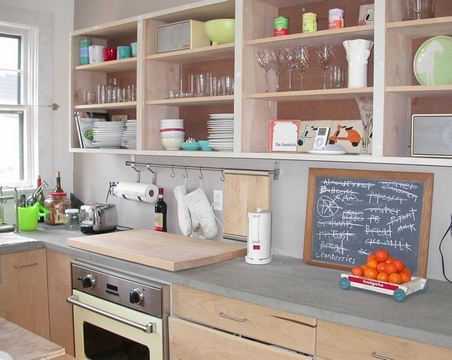 There are two things in this kitchen that caught my attention: the open shelves and the chalkboard. I don't like when all the shelves are open in a kitchen. In my opinion, a functional kitchen should have at least some of its shelves closed, because not all kitchenware is so aesthetically pleasing that it should be exposed. Even this photo is a good example, and there are much uglier ones. But some shelves can be left open to show off our best crockery and some decoration items. This is the classic scheme that works best for everyone. As for second point, I really like the idea with a mini-chalkboard in the kitchen to leave notes and reminders. It's easy and handy. I always prefer handwritten notes, but my husband never notices them and keeps follows only those notes that he makes in his mobile phone. hello, i wonder if anybody knows from where is that great Table-Bookshelf-Cabinet Bed? thanks to anybody who knows.